Fresh water stored beneath the earth’s surface in openings in soil and rock is called groundwater. Groundwater is a valuable resource, as it provides drinking water for many areas. Key concepts in groundwater are: aquifers, that groundwater is arranged in underground zones, the water table, and hot springs. • Groundwater is stored in aquifers, which are units of porous and permeable soil and rock. 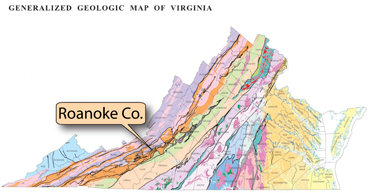 Cavernous limestone, gravel and sand, and fractured rocks make good aquifers. Cavernous limestone makes a good aquifer because it has space for groundwater and allows it to move. Sand and gravel also make good aquifers. 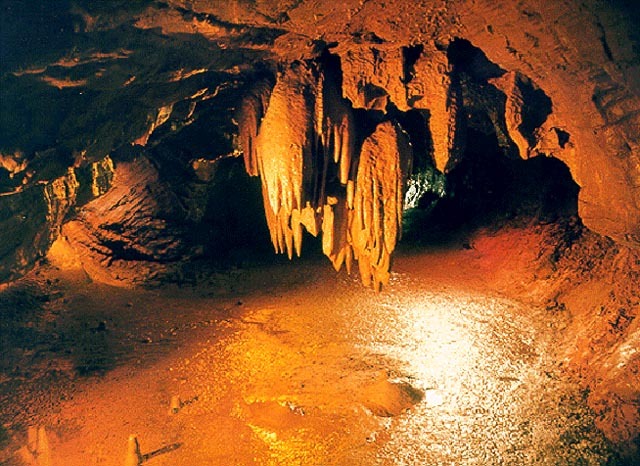 This image shows Dixie Caverns, in Roanoke County. • Groundwater typically seeps into the ground from surface water or from rain. It moves through the zone of aeration to the zone of saturation. 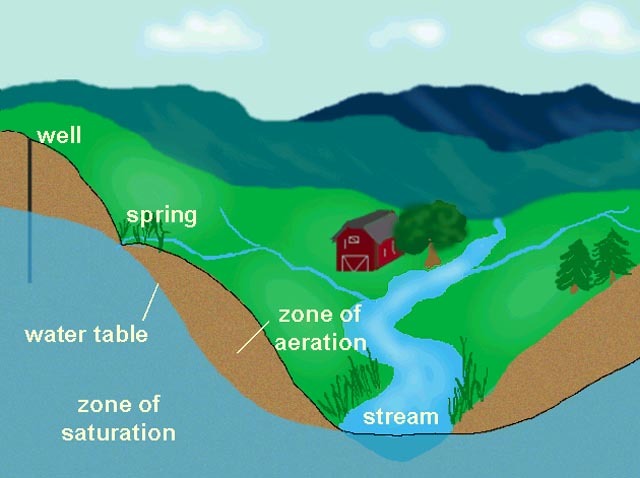 The top of the zone of saturation is called the water table. Water seeps through the zone of aeration to the zone of saturation where openings in soil and rock are completely filled with water. The top of the zone of saturation is called the water table. Where the water table intersects the ground surface, springs and streams form. Note that the depth of the water table varies with the topography. The water level in the well represents the water table.